I can’t get this image out of my mind. It seems so foreign to the spirit of athletic competition on the one hand, and yet it is as entwined in world-class competition as excellent coaches and dedicated training. The image I am referring to is a particular odious one, described in the book, The Dirtiest Race in History: Ben Johnson, Carl Lewis and the 1988 Olympic 100m Final, by Richard Moore. The Second World Athletics Championships were held in Rome, Italy in August 1987, a year prior to the 1988 Summer Olympic Games in Seoul Korea. Ben Johnson has set a world record in the 100 meters with a time of 9.83 seconds, beating rival Carl Lewis who also had a personal best of 9.93 seconds. Moore related a story told by Doug Clement, a former Olympic middle-distance runner who was a coach and a doctor for the Canadian Olympic Association, and was at those World Athletics Championships in Rome. 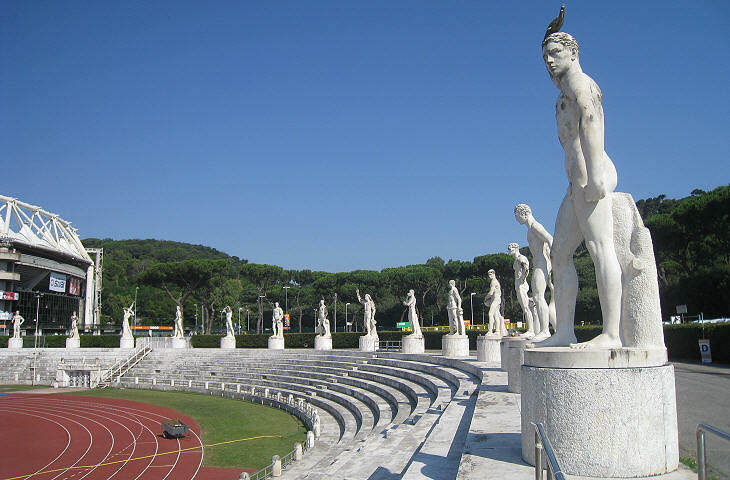 The Stadio dei Marmi, Rome. A year later, Ben Johnson won the gold medal at the Seoul Olympic Games in 1988, only to have it stripped from him after testing positive for drugs in his system. Posted in Doping, Other Olympics, Track and FIeld and tagged 1988 Olympics, Ben Johnson, Carl Lewis, Doug Clement, Richard Moore, Seoul Olympics, Stadio dei Marmei, The Dirtiest Race in History, World Athletics Championships. Bookmark the permalink. I temember watching the ’88 Olympics as this unfolded. The mind-blowing time (9.79) and then the accusations and stripping of the medal. There’s a very good documentary (called “9.79,” naturally) that presents a pretty nuanced view of Ben Johnson’s story. I have a more sympathetic opinion of him after watching it, and with the past twenty-odd years of steroid reality, lies, cover ups, etc. he is not nearly the pariah, in my view. It was on Netflix. Worth 90 minutes for sure for people interested in the intersection of sports, culture and society. I will look up this documentary Will. Thanks! The book I cite, The Dirtiest Race in History, is also a good look at that time, particularly the in depth profiles on Lewis and Johnson, as well as their rivalry.